In China Has Awakened. Are You Ready? I mentioned that I plan on sharing with you digital resources to help better understand global opportunities. My focus, for now, is China. In this post, I introduce you to AccessAsia and Malcolm Moore. AccessAsia provides market intelligence to companies wanting to do business in Greater China and Southeast Asia. From their About Us section, they are based in the UK, Malaysia and China and have been in business since 1997. They've also worked with an impressive roster of companies. Their resources section offers at-a-glance a map of Greater China and Southeast Asia. Click on any country - for example China - and you have a snapshot of the country and some vital links. The links section captures links to newspapers & media, travel sites, culture, business services, governments and stock exchanges. Finally, check out the Weekly Update. AdAge describes it as "a snarky weekly update reflecting relevant business, economic and political issues." Malcolm Moore is the UK's Daily Telegraph correspondent in Shanghai since July 2008 and writes about his experiences in China. His perspectives are fresh, entertaining and insightful. "Chinese man living in airport returns home" is his latest Daily Telegraph article from 2/12/10. 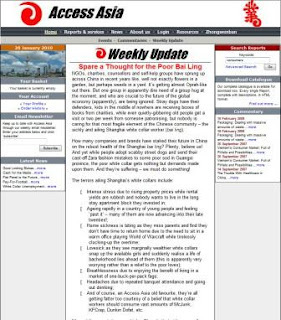 Also check out his Top 7 Chinese Whispers of 2009. Note the references here and in the other China relates resources to "Haibao" - the official blue World Expo 2010 Shanghai China mascot [who reminds me a bit of Gumby...]. Those of you headed to Shanghai for DOMOTEX asia/ChinaFloors may have the opportunity to get up close and personal with Haibao! If so, please do send a picture. Would you let me know what you think of these two resources? If you have others, I'd love to share them here in this space.